However, the original legislation in 1836 did require that an office be provided for the Superintendent Registrar because he was required to officiate at marriages. The Plymouth Register Office for Births and Deaths was at 7 Norley Street. As from Friday April 3rd 1857 the Plymouth Register Office was transferred to number 5 Athenaeum Terrace. It was only in July 1937, after the appointment of Mr Walter Naylor as Superintendent Registrar, that Plymouth amalgamated the registration districts of Devonport and East Stonehouse in to one Register Office at 40 Whimple Street, Plymouth. It was open on Mondays to Fridays from 9.30am to 1pm and again from 2.30 to 4.30pm and on Saturdays from 9am to 12 Moon. Registration of Births and Deaths could be made on Mondays and Fridays between 10am and 1pm and 5.30 until 8pm; on Tuesdays and Thursdays between 10am to 1pm and 2.30 until 5pm; on Wednesdays from 10am until 1pm and on Saturdays between 10am and 12 Noon. When those premises were destroyed during the Second World War the Register Office moved to Thorn Park at Mutley. In June 1951 it was at Belle Vue Place in Cobourg Street. The Plymouth Register Office at Belle Vue Place, Cobourg Street, in June 1951. It finished up in Portland Villas, before moving to its present location in Lockyer Street, near Plymouth Hoe. 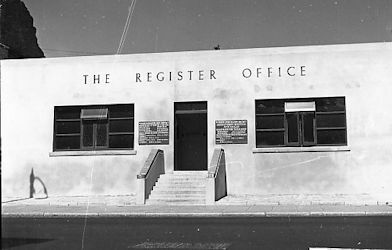 The current Plymouth Register Office in Lockyer Street was opened on Wednesday April 7th 1982 by the Registrar General, Mr Roger Thatcher. A commemorative plaque was then unveiled by Councillor George Creber, chairman of Devon County Council. Also present was the Deputy Lord Mayor of Plymouth, Councillor John Pascoe, and the then Chief Superintendent Registrar of Plymouth, Mr Dan Galliford. Messrs Carkeek and Sons Ltd, were the contractors. The building was designed by staff at the Devon County Architect's office and cost £381,619.